Sofia International Model United Nations 2008 event is going to be held between 20-27 July 2008 in Sofia city - the capital of the Republic of Bulgaria. - All materials during the conference - welcome packages, delegation handbook, ID cards, placards, all additional printed materials, etc. The actual costs for organizing the conference are much higher than the Conference Fees charged of the participant. Thanks to the sponsors the conference the Org-com receives generous financial support to keep conference fees as low as possible. As payments via credit cards or cash are not possible participants are requested to transfer the fees to either of the accounts, listed below. 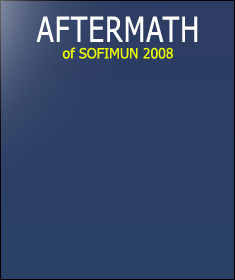 If you are a BULGARIAN citizen, wishing to participate at SOFIMUN 2008 please contact us at recruitment@sofimun.org in order to facilitate on the matter of your participation. ADDRESS: Sofia 1000, 60, Patriarh Evtimiy Blvd. PURPOSE OF PAYMENT: "Your name and surname, SOFIMUN 2008 tuition fee"
ADDRESS: Sofia 1000, 6, Batenberg Str. Please do not pay the fee unless you have been accepted for SOFIMUN by receiving a letter from us noticing that you are accepted. We would like to stress that you will not be registered as a participant of the conference until we have received your fee. Please note that the participation fee will have to be paid by the deadline (30 June 2008) and make sure to include all transaction fees that might arise! 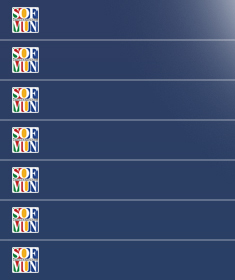 The participation fee is NOT refundable even if you are not able to participate in SOFIMUN ‘2008. Caution: In order your registration to be valid, you have to send us via e-mail a scanned copy of the deposit receipt which includes your full name. Warning: Your presence during the conference is obligatory, including Opening and Closing Ceremonies.